Earn Rs. 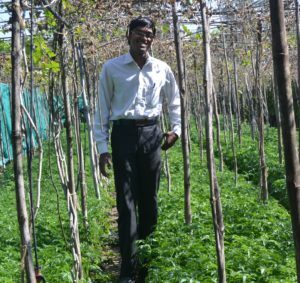 10.50 lakh by growing four crops in one acre farmland in one year. Does it sound unrealistic? Well it is very much possible through four-layer farming model invented by Mr. Akash Chourasiya, 28, young farmer from Tili village, Sagar, Madhya Pradesh. “In this model income is not only generated by selling the harvest of four crops cultivated in the farmland but also by reducing the production expenditure immensely,” he adds. The four-layer farming model reduces 5 times the expenditure and the benefit goes up 4 times. Thus the total earning goes up to 8 to 10 times. 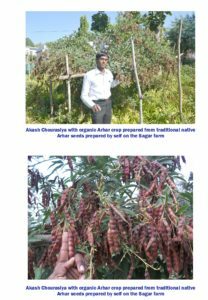 As a young boy Mr. Chourasiya had a dream of becoming doctor, he cleared the medical entrance exam too but changed his path to grow healthy and nutritious food for the people that they never seek a doctor! In order to grow poison free food and make farming profitable he did series of trials and crafted four-layer farming model. In this model, the crops are sown in the same soil but grow at different levels. First land preparation is done by treating the soil with the mix of 100 kg calcium powder dust and 30 kg neem powder. At the time of sowing, the soil is fed with the compost of rock phosphate and cow dung along with vermicompost manure. Only indigenous seeds and saplings are used in this system. Once the farmland is ready, 3 feet wide rows are formed one foot apart and all four crops are sown one after the other. The first layer has ginger/turmeric. Usually ginger is sown in the month of May but in this model it is sown in February. “We sow ginger 6-7 inches below the top soil keeping the distance of 6 inch. Now it would take three months for ginger to reach the top surface so to utilize and keep it safe from weeds we cultivate green leafy vegetables. It becomes our second layer,” he elucidates. Beds of 2.5 wide are created on the rows. On these beds seeds are sown of the any green leafy vegetable like spinach, fenugreek, coriander etc. Within 15 days of sowing seeds of green leafy vegetables germinate and covers the entire farmland. “In this way as direct sunlight doesn’t fall on the soil 70% water evaporation is controlled and there is no scope for weeds to come up in the soil. It saves money on water and expense on removing unwanted weeds,” explains Mr. Chourasiya. In fourth layer it is best to grow papaya. The saplings are transplanted at 12 *18 feet distance. 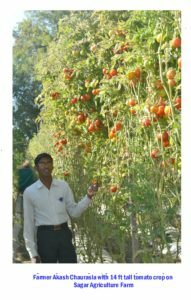 Leaves and fruits of the tree are approximately at 7 feet height so it doesn’t disturb the third layer vegetable crop. In this way all four crops are sown in same month and same soil. Irrigation is done through fogger system enabling efficient use of every drop of water. “Water keeps penetrating down because the soil is porous as no chemicals based agri inputs are used and the soil is treated well with natural agri components. Also through the fogger system we spray a solution of cow dung decoction and vermiwash as the preventive measure from the diseases or pest attack. It is done once in a month. We even have 8 feet high cloth boundary wall on all sides of the farm. It keeps the insects and pests away from our farm,” he highlights. Harvesting time differs for all four crops allowing farmer to have a regular supply of produce for sales enabling him to have consistent cash inflow. Green leafy vegetable is harvested from March-July, creeper vegetable from April-November, ginger from August-October and papaya from November-December. The farm is then allowed to rest and land preparation again begins from 3rd week of January for next cycle. Mr. Chourasiya could craft a successful model for growing nutrient rich food but alone he cannot serve the forever increasing population so he started a movement at the tender age of 21 years in 2011 where he encouraged farmers to quit use of chemicals in their farm and also convinced youth to take up commercial farming. To give momentum to this movement he provides absolutely free-of-cost training on his farm where farmers are given on-field exposure to four-layer farming model, water conservation, maintaining seed bank, rearing desi cows, vermicompost and preparing all other farming inputs on the farm itself. So far he has trained 7,500 youth and 37,500 adult farmers across the country as well as outside India. Along with four-layer farming model Mr. Chourasiya has also developed a system for water conservation and interception of soil flux which can recharge 10 lakh liter water per acre and 4000 kg of soil can stop the flow with this technique. 14500 farmers in different Indian states are using this technique. He has invented natural air-conditioned shades to avoid the impact of climate change through research. “It is imperative to eat healthy food as it keeps our mind and soul healthy that in turn keeps our body healthy. So grow chemical free food for better today and tomorrow. Also Indian youth have to take up commercial farming for improving health of our people and economy of our country,” he concludes.